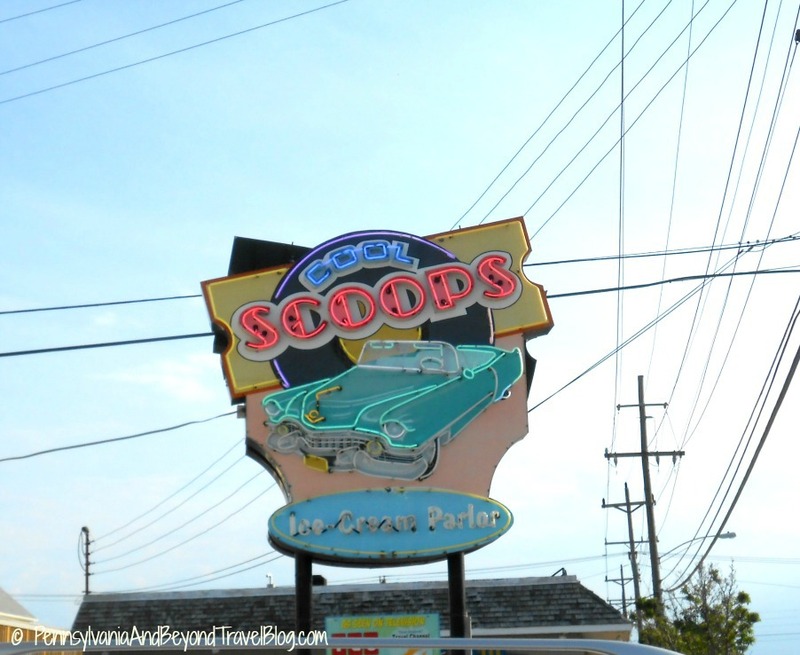 Every time we visit Wildwood in New Jersey we always make sure we stop in to the Cool Scoops Ice Cream Parlor. 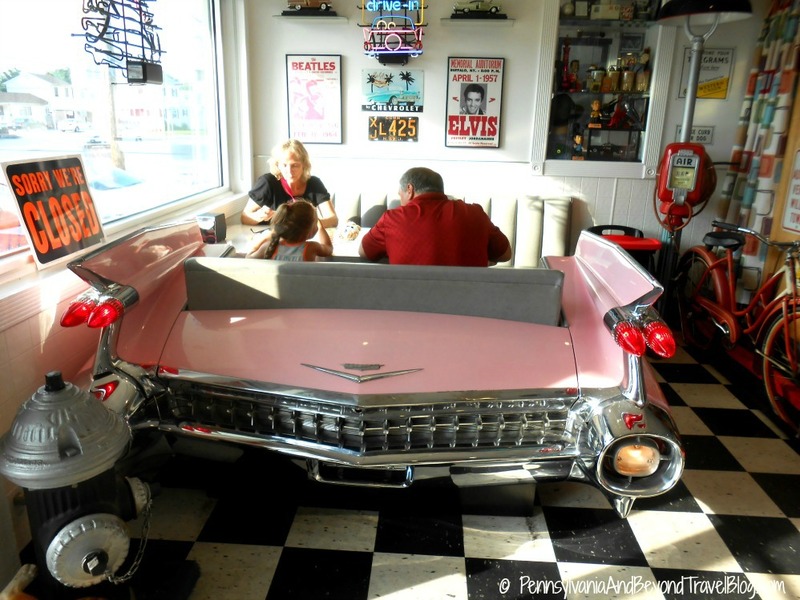 Not only do they have delicious tasting ice cream but it's a great journey back in time! 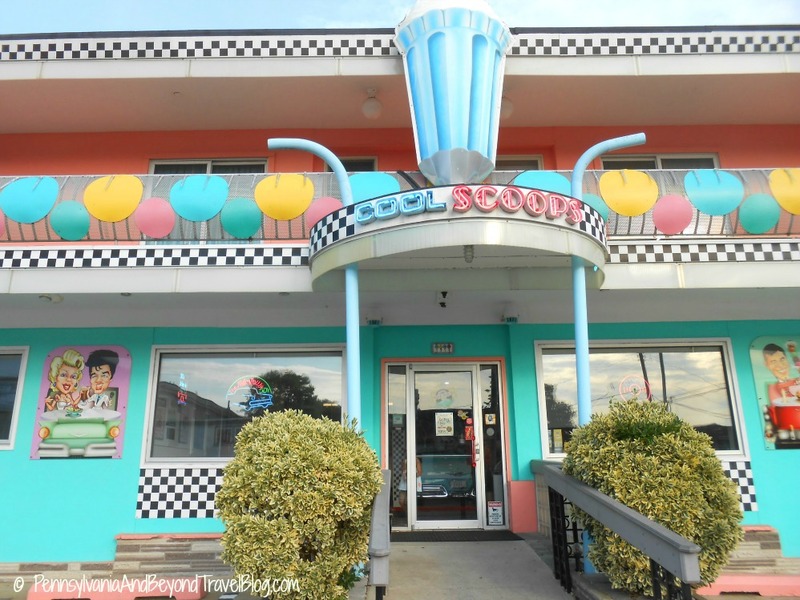 It's your classic Doo Wop style ice cream parlor! This is the same ice cream shop that was featured on the Travel Channel. This 1950's style ice cream parlor features over 30+ hand dipped ice cream flavors. You can get it served in a bowl or various styles of ice cream cones. If you have dietary restrictions, sugar-free ice cream is also available, along with a lot of different sundae toppings & candy. When you first walk through the doors you will see all of their various 50's decor items. 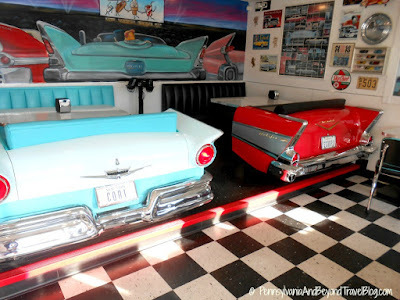 We love to sit in one of the vintage car seat booths but stools and tables are also available. The flooring is all decked out in a white & black checkerboard pattern which is really cool to see. You will see all kinds of interesting vintage things hanging on the walls. Feel free to stroll around the place at your leisure. This ice cream parlor can get very busy during the busy tourist season and at times...lines do form. I suggest visiting Cool Scoops during their off-peak hours. We visited around 7 PM one evening and were one of four patrons in the entire place. Sweet!!! We've also visited early in the afternoon which also seemed to be a good time too. My husband got a mint chocolate chip ice cream cone, my granddaughter got rainbow sherbet in a dish with a cone and candies on top, I got a delicious banana ice cream cone and my mother got a peach sherbet. Everything was fresh and yummy! 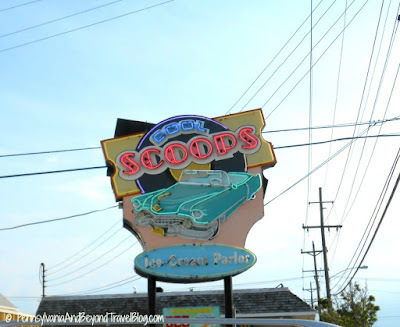 A few days later we went back to Cool Scoops and indulged in banana splits. Equally as delicious! 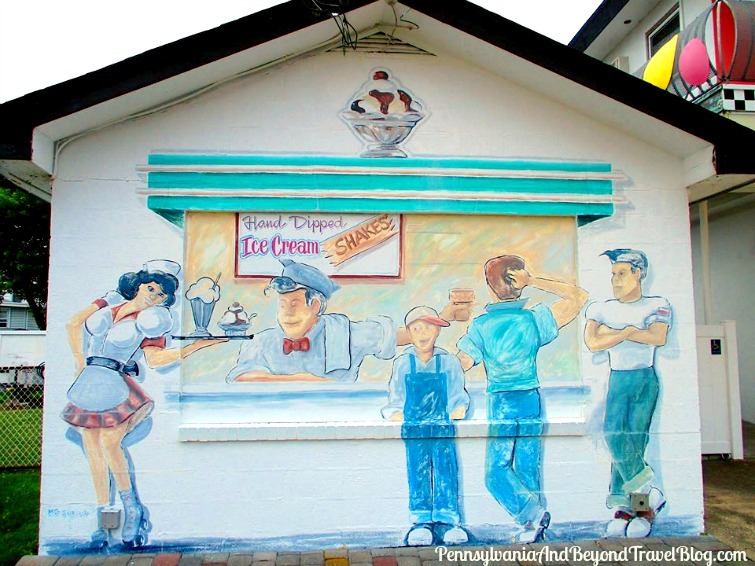 If you enjoy checking out outdoor street art and wall murals, you'll want to check out this wall mural on the side of the Cool Scoops building. Like a lot of the wall murals on the island, it was painted by MG Signs. We've documented many of them right here on our blog under our Street Art & Wall Murals section and over on our Pinterest Board. Isn't this wall mural adorable? I think so!!! 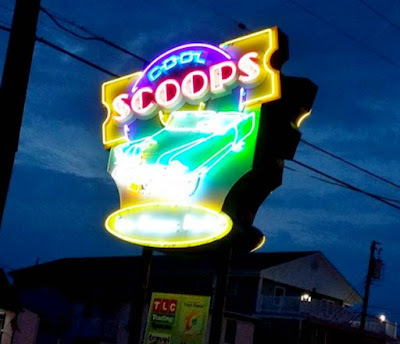 Cool Scoops is located at 111 New Jersey Avenue in North Wildwood, New Jersey. This avenue is one of the main drags through the island and you can't miss it! Their hours of operation vary depending on the season and weather. You'll find FREE parking right out front. Please visit the Cool Scoops Ice Cream Parlor web site online to learn more. Note: You can click on each photo is this post and it will open enlarged in a new window. This will allow you to see a bigger & more detailed view. Enjoy! I love ice cream parlors and many of the old ones are gone. 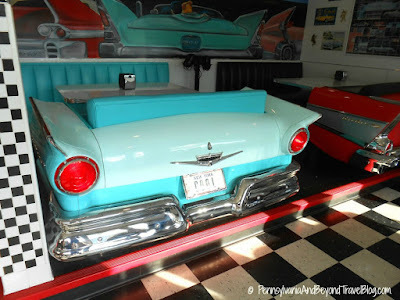 This one looks so retro with parts of cars forming the seats. I shall see if my son and daughterinlaw will take us there when we visit them.